Corporate India plans to make fresh investments after the general election, says the latest Business Today-C fore Business Confidence Survey. Coimbatore-based D. Gandhikumar has a foundry that supplies components to more than 150 companies in India. The components go into motors, pumps and air compressors that are used by the agriculture, automobile and capital goods sectors. For the past two years, he has been fighting a fierce battle against the slowdown. Poor growth in the auto and agriculture sectors has dried up his order book and shrunk his revenues. "Two years ago, we couldn't meet clients' demand due to the high backlog, but today there's hardly any demand," he says. He blames it on multiple factors: erratic power supply across the country, holding up of investments by companies and farmers, high fertiliser and iron ore prices, sky-high interest rates and poor monsoons for the last three years. He says: "Take the case of fertilisers, for instance - if prices are high, farmers are left with no money to buy farm equipment which, in turn, affects demand for our clients' products." He adds that most of his problems can be solved by an effective government. "From June onwards, we expect things to improve." Gandhikumar is one of many small and medium enterprise (SME) entrepreneurs who are pinning their hopes on the next government. 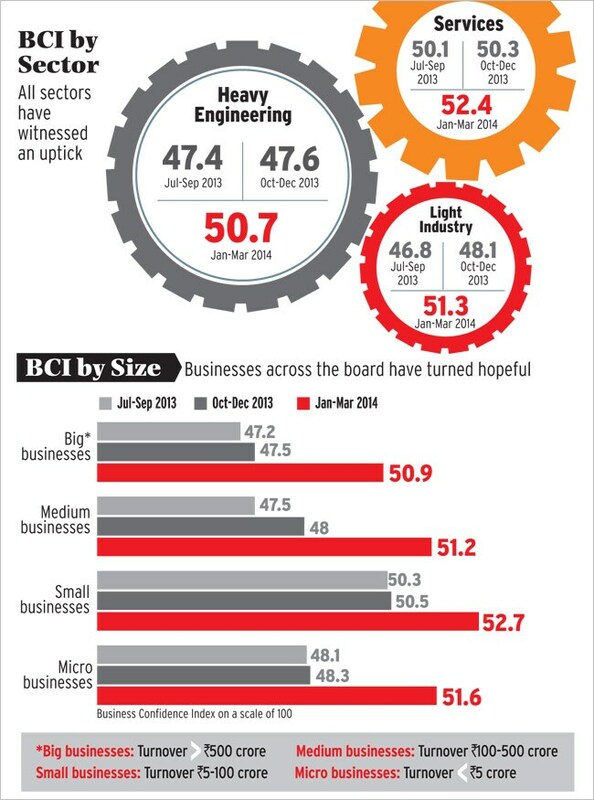 In fact, businesses of all sizes - big, medium, small and micro - are more optimistic today than they were in the October-to-December quarter, according to the latest Business Today-C fore Business Confidence Survey. 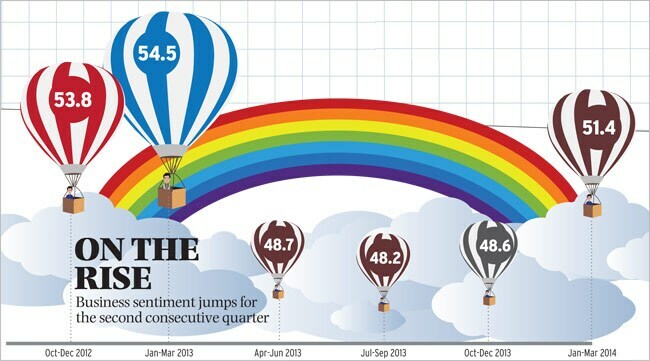 The survey for January-to-March 2014 shows that sentiment in corporate India has improved significantly since the previous quarter. On a scale of 100, the confidence level was at 51.4 in the fourth quarter of 2013/14, up from 48.6 in the previous three months. Market research agency C fore surveyed 500 CEOs and chief financial officers in 12 cities. In addition to the broad index figure, a large number of parameters within the survey, too, suggest an upswing in business confidence. For instance, more corporate leaders today expect the overall business situation (30 per cent) and financial situation (27 per cent) to improve in the current quarter (April to June). In the last survey, which was done three months ago, the comparable numbers were smaller - only 13 per cent expected overall business situation to improve, and 12 per cent expected the financial situation to get better. The cost and availability of finance are two other areas where companies are more confident now than in the last two quarters. In the current survey, 32 per cent of respondents expect finance to be more easily available in the April-to-June quarter. In the last survey, when respondents were asked about their expectations on this issue for the January-to-March period, just 11 per cent were hopeful that things would improve. In the survey before that, the number stood at 16 per cent. Experts say the cost of external and domestic borrowing will be lower in the current quarter. 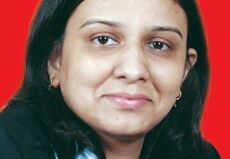 "Since the rupee is appreciating, the cost of external finance is coming down," says Sonal Varma, India Economist at Nomura Financial Advisory & Securities. "If the election outcome is positive, the currency will appreciate further, bringing down the cost [of external borrowing] too." Major respite for the economy has come from weakening inflation - retail and wholesale - on account of lower food inflation. Inflation based on the wholesale price index fell to a nine-month low of 4.68 per cent in February, due to a drop in vegetable prices. "While inflation still remains a concern, we don't see interest rates going up - they will remain the same or go down," says Siddhartha Roy, Economic Advisor, the Tata Group. 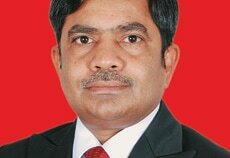 Anil Bhardwaj, Secretary General of the Federation of Indian Micro and Small & Medium Enterprises (FISME), says: "The last few quarters witnessed a vicious cycle of high inflation, high interest rates and slowing of GDP growth. Businesses perceive the future will be a lot better than the present." Business confidence hit a high of 74.8 in the quarter ended March 2011, when the survey started, before dropping to a historic low of 48.2 in the July-to-September 2013 quarter. The last financial year was particularly subdued due to high inflation, the rising current account deficit, the depreciating rupee and weak economic growth. But the situation has improved on many of these fronts in the past few months. 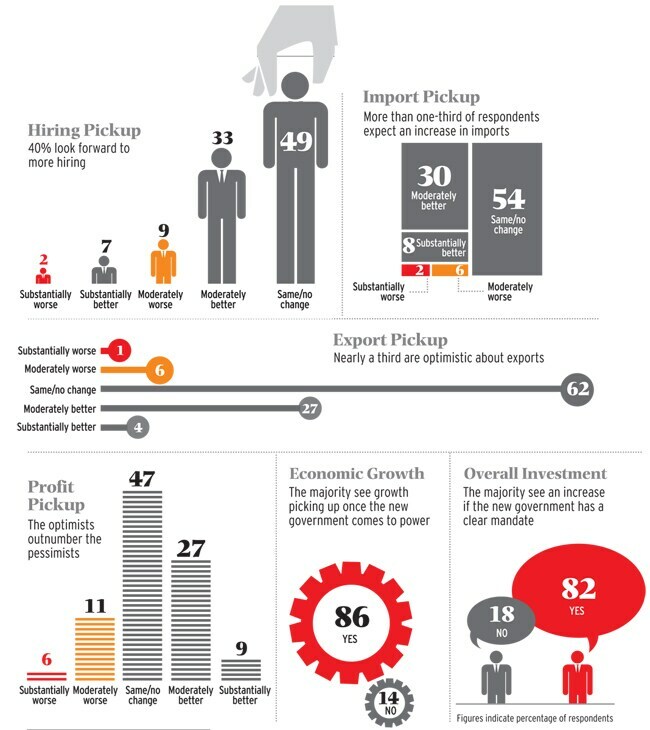 The survey points out that some 43 per cent respondents expect overall demand (for their goods and services) to go up in the April-to-June period while 50 per cent respondents foresee pick-up in sales during the same period. 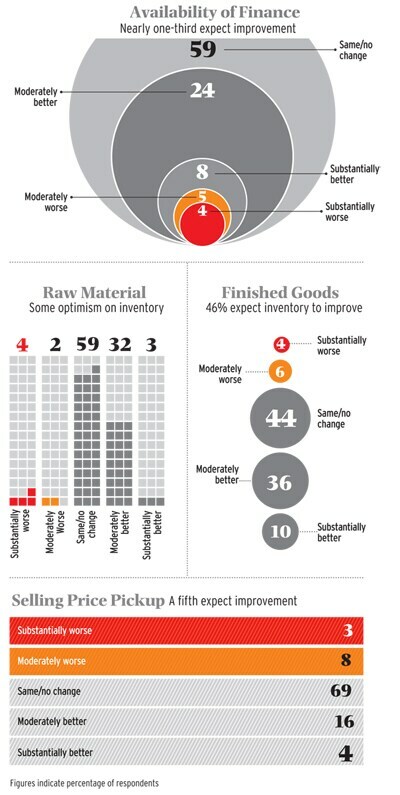 The price of raw material is another area where businesses expect things to improve. For instance, 34 per cent respondents say they expect costs to decline in April-to-June period. Siraj Chaudhry, chairman of the Indian arm of US food major Cargill, says the hardening of the rupee against the dollar has resulted in lower input costs for companies such as his. He says: "Edible oil is a big category for us. We are importers. With rupee appreciation, input prices have come down." The rupee has risen around 12.4 per cent to Rs 59.75 against the dollar since its all-time low of Rs 68.83 in August last year. Nomura's Varma says raw material prices in general will be lower, because of softer commodity prices. "China, the world's largest consumer of commodities, has witnessed moderation in growth," she says. "Prices of commodities such as coal and metals have seen a decline." According to the survey, 38 per cent respondents foresee investments in business operations in the April-to-June period - a significant jump from the last survey, in which only 14 per cent respondents said the same. Interestingly, the vast majority of the respondents (82 per cent) say their overall investment will increase if the new government has a clear mandate. "The elections have raised the prospects of a government that will improve the investment climate by bringing consistency to policies. Increased investment creates more employment and increases per capita income, leading to increased spending," says Rakesh Srivastava, Senior Vice President (Sales & Marketing), Hyundai Motor India. He says his company has invested in three new products in the last six months. "We're keeping a close watch on demand, and will take a decision on capacity expansion accordingly. We'll continue to invest in new products." Forty per cent of respondents expect hiring to improve in the April-to-June period - significantly higher (16 per cent) than in the last survey. Adil Malia, President for Human Resources at the Essar Group, says recruitment is expected to improve in the next 12 months. "Hiring in fast-moving consumer goods, IT and pharma will be more robust as compared to infrastructure and manufacturing," he says. The survey indicates that corporate leaders' hopes of the new government are high, with 86 per cent expecting economic growth to pick up after the election. "Money is flowing into capital markets in anticipation of a stable government. 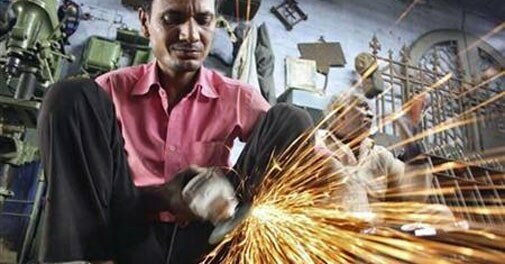 If that happens, one could expect GDP growth to accelerate," says Roy of the Tata Group. Market research agency C fore designed and conducted the survey. Field work was conducted in March 2014. A structured questionnaire was administered to the CEOs or CFOs of companies. In all, 500 CEOs or CFOs representing various industries, from companies of varying size, were interviewed. The survey covered 12 cities: Delhi, Mumbai, Chennai, Hyderabad, Bangalore, Kolkata, Chandigarh, Lucknow, Nagpur, Kochi, Visakhapatnam and Bhubaneshwar. Companies were segmented based on turnover and products. Those with a turnover of more than Rs 500 crore were classified as big, those with a turnover of Rs 100-500 crore as medium, those with a turnover below Rs 100 crore as small, and those with a turnover of under Rs 5 crore as micro businesses.